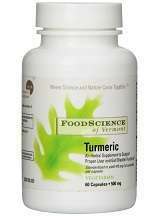 What is Food Science of Vermont Turmeric? When making the decision to go with an all-natural supplement, anyone would want something that targets more than one area of health and wellbeing and Turmeric is exactly that. Food Science Vermont Turmeric doesn’t just promise one of Turmeric’s many benefits but claims that their supplement works as a potent antioxidant that can successfully rid the body of free radicals as well as protect the function of the liver and gall bladder and maintain blood cholesterol levels as normal. The entire capsule of Food Science Vermont Turmeric is made up of 500mg of Curcuma Longa Root extract, 475mg of which are curcuminoids. Curcuminoids are the element of Turmeric which has all the health benefits, curcuminoids are usually at very low levels when Turmeric is ingested as food, as a food source, or without purposely extracting curcumin. Other ingredients include vegetable cellulose, microcrystalline cellulose, vegetarian leucine which are common variables used as filling and binding agents in supplements and medicine. Food Science of Vermont suggests that their Turmeric supplement be taken twice a day, once with breakfast, and another with lunch for optimum effects. Food Science of Vermont do not sell their supplements from their website directly and instead are tied with many online sellers and international sellers. One of these online sellers is Walgreens which sells Food Science of Vermont’s Turmeric supplements for $33.99. There are no side effects listed directly on the Food Science of Vermont website for their Turmeric supplement or any other supplement. It is known, however, that the most common side effects of turmeric, when taken in high doses, is diarrhea, nausea, and indigestion as turmeric is very hard for the body to break down and absorb on its own. This is why it is highly recommended that you stay within the recommended dosage. Food Science of Vermont also states that customers are advised to speak with their physician prior to taking this supplement if they have any medical conditions, especially gallstones or gallbladder disease. Caution has also been advised to pregnant women, breastfeeding mothers, and anyone under the age of 18. It is advised that the use of this product is discontinued 2 weeks prior to any scheduled surgery. There is no guarantee or return policy anywhere on the Food Science of Vermont website, neither are there any reviews for their products or allocation to leave reviews. However, there is a toll-free phone number available should anyone have any clarifications or further queries. You should pay attention to the return policy of the store where you are purchasing the product. Food Science of Vermont does clearly display the properties of their supplement on their website which is an important factor for customers. They do adhere to the recommended dosage of curcuminoids in order to achieve results. However, the Food Science of Vermont had very minimal information on their Turmeric supplement with no listed side effects available.This supplement also doesn’t have BioPerine or anything that would make it better absorbed by the body. The pairing of a lack of guarantee and no allocation for customer reviews is a testament in itself of the company’s own confidence in their product.